A former member of the Cardiff Blues Academy, Gill represented Wales at Under-16 and Under-18 levels before signing with Cardiff RFC as an 18-year-old. He made his Cardiff debut in 2005 and went on to become a member of the Wales Under-21 squad that season. He finished his first season for the club with 18 appearances and made his Magners League bow with the Blues against Munster at Thomond Park in May 2006. The loose-head was signed by English Premiership side Saracens in 2009, having been scouted by the club's assistant coach Cobus Visagie as a powerful set-piece performer. His development was rewarded with a place in Wales' senior squad for the 2010 Six Nations Championship, but he was limited to one cap off the bench against Ireland. 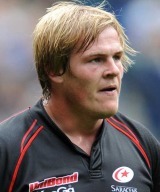 After helping Saracens to a maiden Premiership title in 2011, Gill was handed another chance in a Wales jersey - against Ireland in the opening game of the 2012 Six Nations.